Squash is fantastically good for you but often overlooked. Here’s a simple yet tasty way to eat squash and fill up with a warm and hearty meal. 2 good handfuls of Arborio risotto rice. Heat the oven to 180C and on a baking tray lay out the squash, drizzle with oil and a pinch of salt. Place in the preheated oven. Fry off the pancetta in a pan with a glug of oil, until it turns golden brown. Remove from the heat and set aside. In another large pan, heat some oil and add the butter before adding the onion and garlic. Cook for two minutes and then add the risotto rice. Stir to combine the ingredients and after a couple of minutes cover the rice with some of the chicken stock. Turn down the heat so the stock is simmering and allow the rice to absorb the liquid before adding a drop more. Keep adding the stock, a little at a time and waiting until the rice has absorbed it before adding more. Once all the stock has been absorbed by the rice, check the rice is cooked (you may need to add additional water), stir in the squash, the pancetta and a good handful of pine nuts. Gently stir for around 2-3 minutes. Season well and serve. This sounds delish, and I would recommend adding some herbs such as sage to the risotto too. 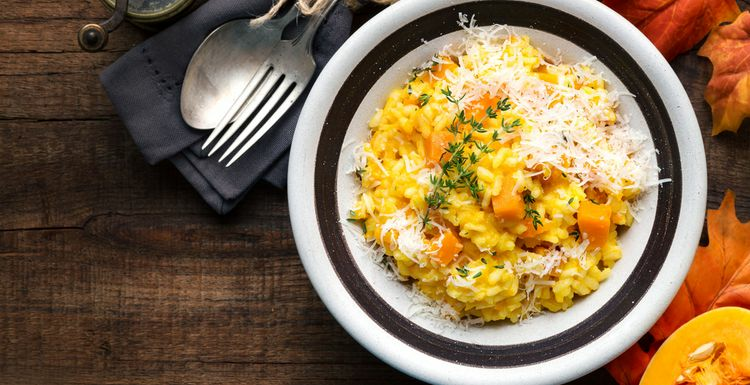 I have a thing about butternut squash at the moment and have never done it in risotto, so I am going to try this next week.